Recently a friend and I decided we wanted to get more exercise into our week. We both aren't keen on the gym or going to classes, so we decided Thursday evenings are our time to meet up and go for a walk for an hour. We've even started to use some of the exercise equipment in the park and feel more confident doing so in the evening's since there are less people around. When I get home from our walk my legs feel tight and achy so I was excited to try out the e'lifexir ACTIDREN revitalising leg gel. The e’lifexir natural beauty body care range consists of 7 products, technically developed to support and perfect different parts of the body. Each product combines natural and organic ingredients clinically researched to target specific needs and deliver specific results across various body zones. The range is vegan and cruelty free along with being hypoallergenic and dermatologically tested. 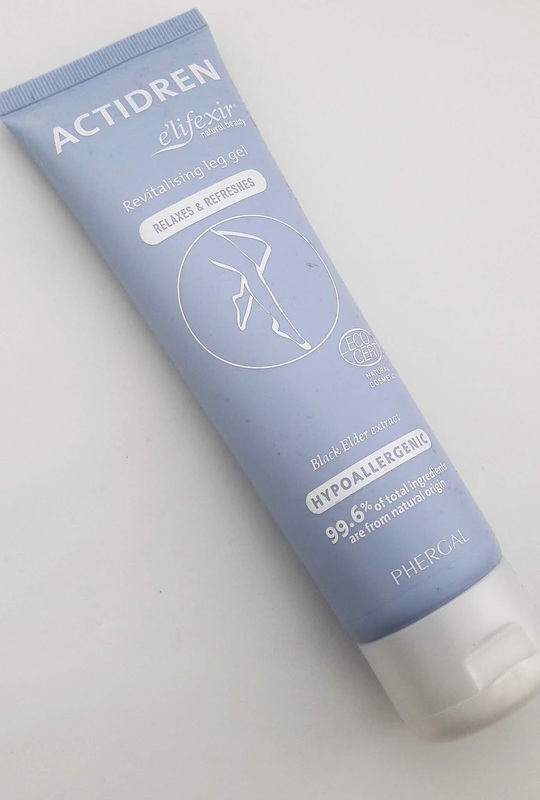 As I have mentioned above I've been trying out the Actidren revitalising leg gel. The leg cream soothes and relaxes legs making them feel lighter, relaxed and soft. I have to admit I have found that for me it does really work as it should do and my legs certainly feel more lighter and relaxed and definitely more softer since using. I've been using the leg cream most days especially before bed after a long day and my legs have definitely felt different. So how does it work? Fluid and toxin reduction: Black elder extract helps to improve microcirculation and decongestion of the skin tissue, which will help to relieve the feeling of tired, heavy legs. Anti-redness: Sore, tired legs can often appear red and blotchy. To help reduce this, Rutin, a citrus flavonoid found in a wide variety of plants, together with olive oil are used to reduce the symptoms of heavy legs. Natural fruit waters including cherry, cranberry and grape which are all rich in antioxidants, are used to protect the skin from free radicals, preventing further redness from occurring. Calms and refreshes: Acticire®, a natural, multifunctional active ingredient based on jojoba, mimosa, and sunflower waxes, provides skin with lasting comfort, making legs more relaxed and intensely moisturised. I've never heard of this brand, looks like a lot of benefits in this product! Like the thought of the cool towel!